When I made the beet salad last weekend I made a balsamic sauce for on it. I was looking at the balsamic vinegar I bought at Wegmans a little more closely and noticed the three leaf mark. I have learned the importance of using the right kind of olive oil in cooking and was curious what the deal was with balsamic vinegar. A little research showed that "Today, commercial production of authentic balsamic vinegar is governed by a consortium of producers, Consorzio Produttori Aceto Balsamico di Modena." Wow. That sounds super important. 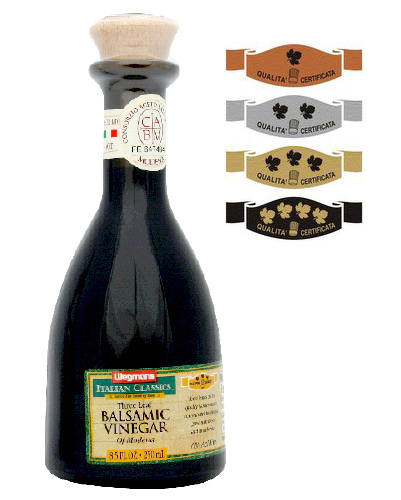 The best balsamic vinegar is called Tradizionale and Condimento balsamics. What I use is a Industriale or mass-produced balsamic which has a four leaf ranking system. I used a three leaf balsamic vinegar for my sauce but one of these days I am going to try a Tradizionale and Condimento balsamic vinegar. I read in your research that some balsamic is drunk like a rare port and I, having a sour, sour-tooth, know first hand how good a gulp of vinegar can be - but who knew that there was such a scale! I'm going home and checking what I've got in my pantry. Thanks for sharing! we just moved to NC and i just spent a little over an hour in harris teeter. i used to think wegman's was the bees knees, but no more. HT has SO many vinegars it was making my head spin! and tons of different olive oils! there were so many others food products i'd never seen before and i've lived all over the world. i never thought i'd feel this way about wegmans...but, c'est la vie!